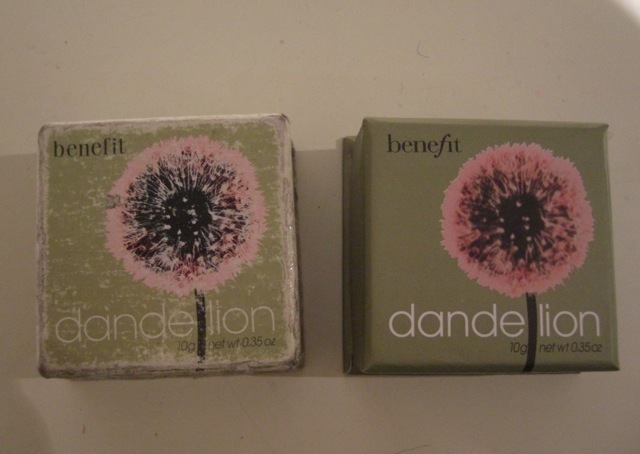 When my much loved Benefit Dandelion blush ran out I decided to buy a new one from eBay after noticing they were a lot cheaper than in the shops. It arrived the next day, and on first inspection I was really pleased as it appeared to be genuine and looked pretty much identical to my original for around 1/3 of the retail price. However when I used it I noticed the powder seemed more ‘chalky’ and there was far too much on my brush (unless you are into the clown cheeks look!) I also noticed the box felt a bit light, which seemed a bit odd. After googling ‘Fake Benefit’ my suspicions were confirmed. Unbelievably benefits gorgeous packaging and products are some of the most regulary faked in the beauty market!! Luckily I have been refunded as it looks like the supplier was duped too. 1. Firstly the fake box is probably lighter. 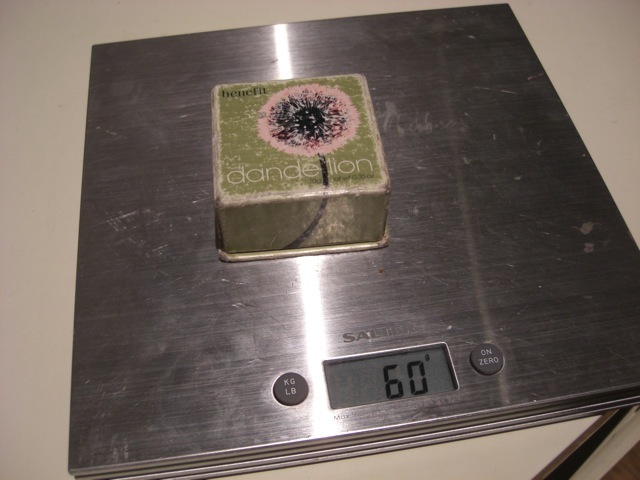 A genuine blush should weigh about 20g more when full. 2. The F in the word ‘benefit’ used to be straight, however since I bought mine 5 years ago the packaging has changed and it is now curved. If it is straight then it is likely to be real (older packaging), but if it is curved then look for the other points mentioned on here. 3. The fake dandelion pic has a very faint white rim around the edge- like it’s been super imposed. 4. The ‘Peel Here’ sticker on the base should peel back and reveal the ingredients on a real blush, on the fake it is just a glued down label. 5. The genuine powder is shimmery, smooth and has a delicate scent. The fake is more chalky and has a cheaper smell. 6. 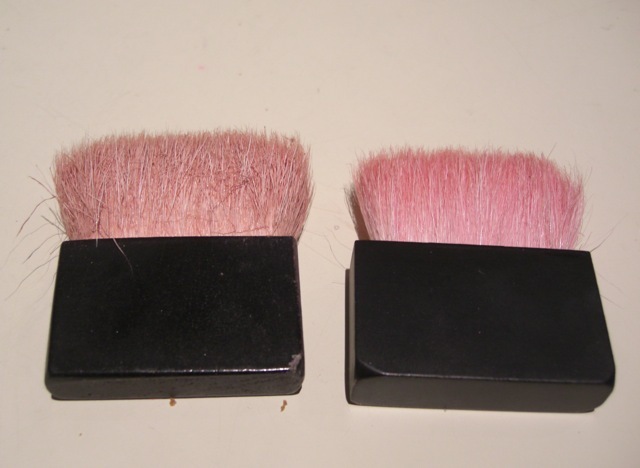 The genuine brush has a slimmer black base and higher quality bristles: You probably would not be able to tell unless you had a real one to compare it to! Please note these rules don’t necessarily apply to all of benefits products, but if in doubt have a really good look at the pics on the benefit website and compare them to the product you are going to buy. There are a lot of fakes on eBay! so ask the seller for the actual photo’s of their products rather than pics they have copied and pasted: and if the price seems too good to be true, then it probably is. Hi, I think I just got one of these too. Ugh. But I have a question- on the Benefit site, the ‘f’ in Benefit IS curved. Is there a newer box for this powder? I’m so confused and just trying to figure all this out. Thanks for the info. 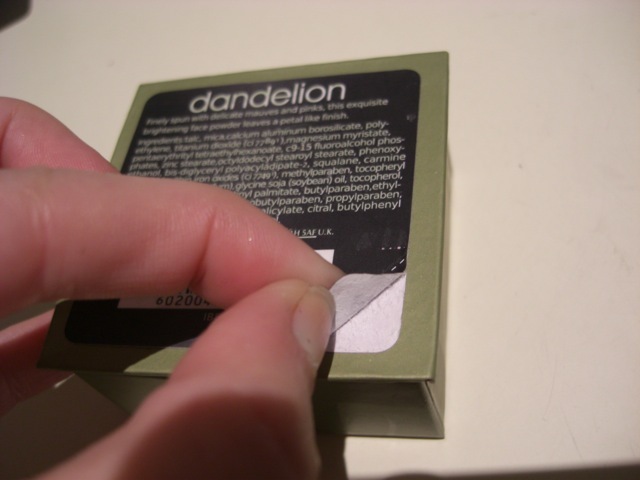 I think the F is curved in some of the products as you can see from the Benefit website and I have read this in other blogs, but on the Dandelion it should be straight. As far as I know the box has not changed. I think the packaging may actually have changed now as my friend has a genuine dandelion blush she bought from Benefit and the F is actually curved on hers. I think the best thing to do is pop into a Benefit Stockist and have a look. The real giveaway is that the fake product feels really light. have just saw this post and realized mine was a fake one too. the brush was rough, powder was chalky and the label behind is glued on instead of peel off! Thanks for your post, if not I will still be using without knowing its fake. omg i don’t know if mine is fake. After a couple of days or carrying around the ‘Fake’ one in make-up bag it cracked. If you bought the Coralista for cheap on eBay then it probably is a Fake….google a few blogs and see what you can find out about it as all products do vary. Hope this helps! Hi I purchased some Benefit products. 1. The Highligher pencil, gleamed. Half the wood was missing. Most of it under the lead was just gold nib. The wood also felt cheap, as in the paintwood on it. Again a good copy but smelt highly of petroleum. Not usual Benefit smell. 3. Celebutente – This looks real too. Products smell like benefit products. Serial number on both packets. Thou the lipstick/benetint serial numbers are different. Labeling overall looks good. 4. Justine Case – No serial number on outer box or inner box. Again looks like good copy, but the packet sicker was lob sided. Inside there was grit on the mirror. The 3 bottles looked smaller then 2.5ml…i measured and only 1.8ml in bottle. Compared to website, the benetint writing is wrong…letters not exact same design. Also on each bottle, the benefit has a dot above i which should not be the case. The bottles smelt like petroleum/greasy (must have been made in dirty factory). The cream was meant to be 2.2g, didnt look like that amount. Benetint also looked a funny colour, brush wasnt great. In all, the Lemon Aid and Celebutente seemed exact products. The pencil and Justine Case were definite copies. xkirstykirstyx is the ebay name…BEWARE !! Yep I have fallen victim to the same thing. I recently bought some Benefit Hush! cream blusher on ebay. It was obviously much cheaper and most of the stockists I had been in store to had sold out. The seller was good and delivered quickly so unfortunately I left good feedback before I realised I had a fake. My suspicisions were first aroused when I looked at the label on the tube which wasn’t straight & was made of thin plastic that had gone wrinkly. The texture and consistency of the cream is not as good as the real stuff & it doesn’t blend so well. The colour is also noticeably different when you compare like with like. The tube also has a really big hole where the product comes out, but the genuine ones have a much smaller one. I guess so you can control how much you put on! There seems to be quite a few people selling the cream blushers, how many are fakes I don’t know. I’m beginning to think quite a few. I was also looking to get some dandelion blusher but given what I have read about Benefit fakes on ebay I might just save up some advantage card points & buy it in Boots! I would definitely always buy from a genuine stockist now. Although it seems expensive at first the blusher lasts for a good couple of years, even with daily use so it is worth investing in! Unfortunately before I read this article, I bought a fake one on ebay too. This one does have a peel back, but exquisite is spelt as “expuisite”, and also note that the dandelion letters on the box are a bit fatter than the original.. I recently bought a fake Benefit Benetint from the ebay seller Greatfauxgizella (at the time didn’t notice the “faux” in the name; not sure if they acknowledge it), but I digress. I’ve only owned the sample size benetint so I was a little familiar with the smell and color. 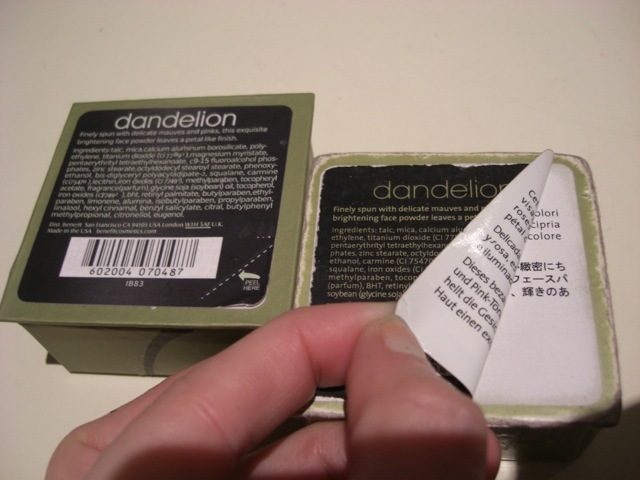 When I received the product, I opened and I saw lots of little bubbles on top. It smelled funny and not like roses like the original. And it was not the same color. I had suspicions and online comparisons photos of the real and fake Benetints confirmed it. Upon closer inspection of the box and bottle, it has the most broken english and incorrect spellings all over the place :-S Of course I haven’t heard from the seller. Lesson learned, I will not buy pricey objects unless I can actually afford them. I bought Coralista from Ulta, and yes it was pricey but omg it lasts FOREVER! Its actually a bargain if you own it for a long time and use it everyday like I do. Beware girls! Do your research first and don’t get caught up in “great deals” impulses. Hmmm …. Thats a worry… I am a die hard benefit fan and have noticed you can buy in wholesale lots from china…. It seems very cheap and i am not sure how you would know what you are buying to onsell retail online…. Except for the obvious country of origin … How can you tell a fake or box of fakes before you buy it? Any tips? ANy cheap wholesale lots from China are fakes-benefit control their distribution tightly and do not manufacture in china . (as far as I know) unfortunately they cant control all these fakes! some are v easy to spot e.g. see mariama0208 on e-bay 505 lemon-aids sold @ 3.40 (including postage!!!) Im surprised Benefit dont/cant take some action! I have had to contact the European Consumer Advice about this and is definately the worst buying experience I have ever had online. Great post. It’s so important that we get the message out there about fake Benefit products on eBay! 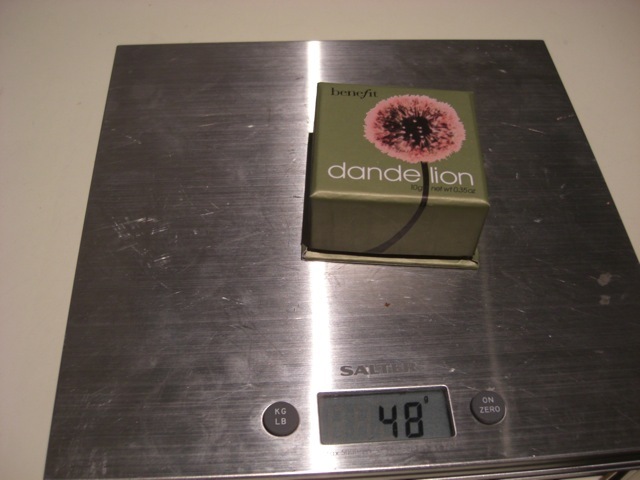 I got a fake Dandelion too, and have written a post with lots of pics comparing the real and fake. My fake one looks a bit different to yours, for example the back label does peel back and the picture on the front is a darker green. There must be a few different manufacturers making the fakes, as they’re not all the same!! Thanks for the helpful post- there is a TON of fake benefit on eBay sadly. A lot of it is coming from the same guy/lady in Brooklyn, NY. I, along with a few other people who bought from him/her can personally confirm it is 100% fake! They use a stock photo though, so ask for a real photo before buying if you are looking on eBay. These sellers are all the same person selling FAKES. When one name gets too many negative feedbacks or reports to eBay, he opens another account and starts selling from there.